BizReport : Research Library : Ifbyphone, Inc. When you hear the term "voice broadcasting," you may think of an automated phone message from your kids' soccer coach reminding you of practice next week or a boring marketing blast. Most people think of voice broadcasting impersonal, inflexible message that doesn't give the recipient the option to ask questions, reschedule, or connect with a real person. But voice broadcasting is more than a simple recorded phone message; it's an interactive customer notification tool. 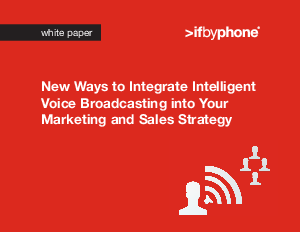 Download this white paper to learn how marketing and sales professionals are using intelligence voice broadcasting to cut costs, save time and generate leads and revenue.